This recipe is perfect for a light summer lunch. Tomatoes are available in many colours so try to get a good mix. Preheat the oven to 120’C. Halve the tomatoes around their middles and arrange on a roasting tray. Sprinkle over a generous pinch of Pure Oak Smoked Sea Salt and crack over some black pepper. Place in the middle of the oven for an hour and a half – two hours but keep an eye on the smaller cherry tomatoes as they’ll cook much more quickly. The tomatoes are done when their skins are blistered but not burnt. While the tomatoes are cooking, heat a 23cm oven-proof frying pan over a medium heat and add a splash of olive oil. Cook the spring onions for a couple of minutes, then add the garlic and cook for another minute or so before adding the spinach and lemon zest. Cook for a couple more minutes until the spinach wilts and becomes bright green and glossy. Take off the heat and drain off any excess moisture through a sieve, pushing down with the back of a wooden spoon. Wipe the pan down with kitchen paper to dry, then rub the olive oil around the sides. Set aside for later. When the tomatoes are ready, turn the oven up to 180’C. Pour a little more olive oil (about 1 tablespoon) into the bottom of the frying pan. Place them cut side down on the base of the pan (don’t worry if there is some overlap). 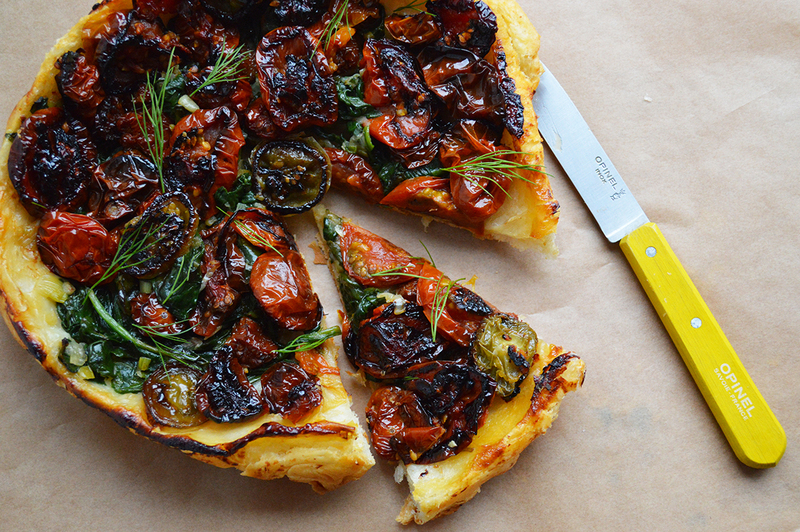 Arrange the wilted spinach on top of the tomatoes, then cut a sheet of pastry just larger than the rim. Lay the pastry over the spinach and tomato mix and pinch the sides in. Place in the oven for 25-30 minutes until the pastry is deep golden and has puffed up. When you’re ready to eat, run a spatula around the edge to loosen the sides of the tart and place a slightly larger plate over the top. Holding the pan and plate together with one hand on each side, bravely flip the pan over and give it a sharp knock to loosen any sticky tomatoes.